Here is a recipe just to give you a glimpse of my journey. I selected that one to share with you because it represents specific memories of my childhood. The chestnut trees are very common trees in Belgium, we had a couple in our garden growing up. Belgian food lover and Mom of 3 living in sunny California and enjoying everything about it. I live in Los Angeles, California and moved here a few years ago from Brussels, Belgium. I get inspired by my beautiful family and try to cook the best possible dishes for my husband and 3 kids. I have decided to write a Christmas cookbook with my all time favorite holiday recipes because I wanted to share my heritage with the people I love, my friends and family. I feel that I am contributing in a tiny way to their holidays and maybe helping them building special moments on their own. Christmas is my favorite time of the year. I love everything about it: the traditions, the spirit, the carols, the joy. The holidays are about family getting together sharing a magical moment; It just makes me happy. For me Christmas means snow, cold weather, hats and scarves, snowball fights and snowman building. Hot cocoa with whipped cream; cold feet and hands that we would warm up by the fireplace while roasting chestnuts. More importantly, Christmas is all about traditions. These have always been an important part of my life. I truly believe that they have shaped who I've become as a person, a wife and a mom. I feel that it is my role as a mother to pass them along to my kids, especially since we moved on the other side of the world in Los Angeles. I want them to embrace our new culture but I want them to remember where they come from and our family traditions are part of who they are today. I make a point on having our traditions every year, such as buying our christmas tree together and decorating it as a family while listening to Christmas carols. I love to cook breakfast, lunch and dinner and prep the table for Christmas. My kids' favorite tradition is, coming December 1st, we start watching all kind of Christmas movies. They also enjoy making eggnog and drinking it by the fireplace, sharing stories about my husband's childhood and mine, it creates memories! All the recipes presented in the cookbook are delicious, sophisticated and yet easy to prepare. Every dish reminds me of my childhood. Some might seem hearty but I have done my best to adapt them to healthy California cuisine without compromising them too much. Here is a recipe just to give you a glimpse of my journey. I selected that one to share with you because it represents specific memories of my childhood. The chestnut trees are very common trees in Belgium, we had a couple in our garden growing up. We had so many chestnuts that we had to use our imagination to find ways of cooking them. 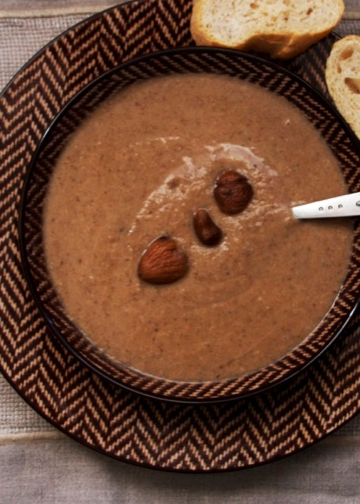 This featured recipe of the chestnut soup is one of them, it is so delicious and comforting and yet so easy to prepare. I have tried to come up with a list of dishes for the cookbook that should make everyone in your family happy. I know it will be the case at my house. All the recipes are a part of my European heritage with a local California twist. You can be assured that they will make all you guests happy without keeping you too long at the stove. I am not a professional, just an hedonist mom who loves to eat and cook and is happy to share it. We had several chestnut trees in our garden when we were growing up. When fall arrived we had so many chestnuts that we had to be creative and nd new ways to cook or bake with them. You can only roast so many in the chimney (which by the way is one of my favorite smells!). This soup is perfect for colder or rainy days, which are numerous in Belgium. It is comforting, creamy without the use of cream, and has a sweetness to it that just does it for me. 1. Sauté the onion and garlic for 1 minute. 2. Add the mushroom and sauté for 5-7 minutes to release the avor. 3. Add the chestnuts and thyme and mix gently, leave for another 2 minutes then add the stock. 4. Bring to boil, then simmer for 1 hour. 5. Put in food processor, add salt and pepper. Garnish with some chopped chestnuts and a dollop of greek yogurt.